I whip Stevie the Corolla around, park, and ask if Leah Rutz would like a ride to her house, where we were planning to meet. I can almost count every freckle on her smiling face as she agrees and hops in. Sick from the jelly beans, I refuse a pistachio snack and realize the already organic nature of our interaction: It’s a laughter-filled minute before we arrive at her temporary home. 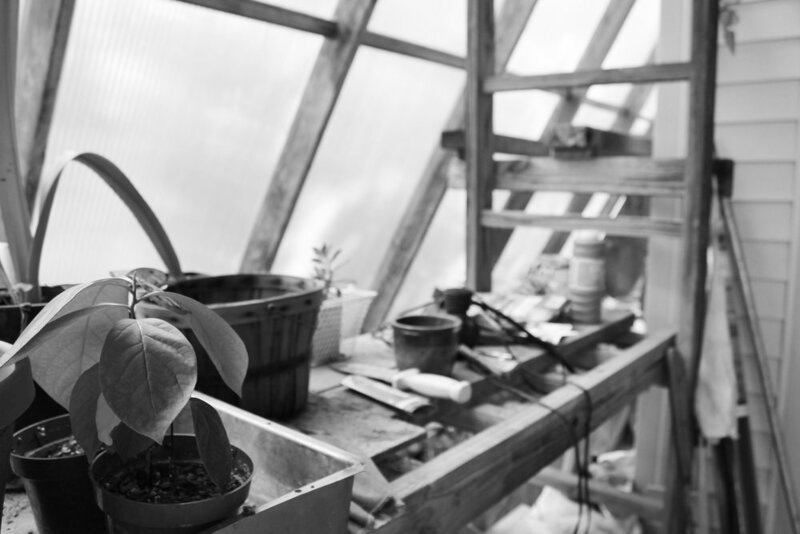 Leah is an intern, given a stipend to live and work alongside the people that are actively participating in Price Hill’s Enright Ridge Urban Ecovillage. The village itself is made up of a single street – Enright Ridge – and active neighbors willing to help one another assess their needs and provide food from seed. The green patches in front of homes are free to grow wild with veggies, flowers, and anything else beyond grass. I can see Leah has comfortably settled there as she climbs the stairs to the home of Jim Schenk. Jim is a founder of the ecovillage and providing guidelines for the internship. She shows me the greenhouse attached to the purple framework of the house – built by Jim – and my heart smiles as I resist running in. She describes Jim as the most loving and cheerful person she’s ever met. She knew this from the start when he came to speak to her class: Without hesitation, she was the first to introduce herself and beg for an internship. She reminds me that we are allowed to define what is real to us. Leah is first and foremost her own version of a “baby activist,” searching for ways to further her understanding of how to be a force in the world. As an urban planning major at the University of Cincinnati, she has learned how to live in a corporate setting with muddy boots on. Although a city building may be comfortable for others, she’s realized a passion to interact with what is outside the windows while working other internships. Knowing that the ecovillage would be unconventional in her field of study, she ran for it anyway, and hopes to share the importance of community engagement in urban planning spaces. Leah tells me she never had enough light to keep her from wilting in the office. She compares herself to a blade of grass; I ponder this. She reminds me that we are allowed to define what is real to us. In her eyes, being a part of the land every day, working at a pace to achieve basic needs, is what makes her feel real and fulfilled. She’s climbed literal mountains, only to return to a strict schedule of school and work she wasn’t invested in. But then Jim and the ecovillage came along with full laughs and sunkissed skin. Dirt tells the story of what they are nurturing. Leah tells me she’s climbing a self-created mountain now, a mountain she discovered here in the community. She has always dreamt of community living, but never knew it existed in Cincinnati. After crossing over in the west end of town, she found empowerment in education outside of any construct she’d ever been a part of. Leah pours over the feeling evoked by food growing from seed and living in a nurturing community. When she mentions that people can open bags and boxes of food but can't grow broccoli, I start to think that perhaps we enable each other to be less human by disregarding our ability to sustain ourselves. Leah tells me she truly understands the idea of being a piece of this Earth after spending time working alongside Jim. Every morning she finds herself among trees, in the dirt, and still welcomed into the house – because dirt tells the story of what they are nurturing. For now, she has never been happier, and I hope she never has to descend from her mountain. We often feel an expert has to be well versed and experienced, but I see passion and expertise in people my age, like Leah. She does not fear the unknown; she is comforted by it, ready for new things to come her way. She is learning the ways of a community that is intentional. They go to each other to resolve problems, and although there will always be some dysfunction, the integrated community finds a way to keep steady. Leah tells me that Jim has a “cozy” way of life. They care for one another first and foremost, sustain life as it is now, and leave time to be visionaries at the end of the day. There is no need for surplus because we allow it to eventually rot, and they will not let their garden die. Leah wants to bite into the fruit life is giving her. She has found time in her busy workday, even after being stopped by neighbors to chat, to be a visionary. In the time between now and December, she will be working on a new project brought on by attaining new land. She calls it the Ice House Property Project. The project aims to include more of the community in the growth the ecovillage has nurtured. The Ice House Property will be turned into a pavilion with an edible fruit and veggie garden anyone can participate in. We bond over getting through school so we can be immersed in what life has to offer. She is still munching on her pistachios and soaking up the sun when I leave. Leah is not a blade of grass, but a flower, never accepting shade from the life she is so ready to take on.